The wait is almost over. In only a few days, you'll be blasting battle droids, shooting down TIE fighters, and overcoming legions of First Order stormtroopers in the Star Wars™ Battlefront™ II Beta on PlayStation 4, Xbox One, and PC. Players who pre-ordered before October can start playing on October 4, while the Beta opens for everyone else on October 6. The Beta closes October 9. Galactic Assault is Star Wars Battlefront II's 20 vs. 20 multi-stage mode. 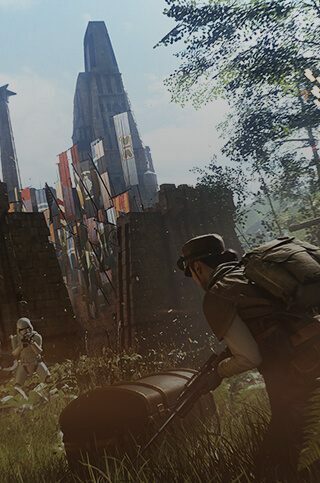 In the Beta, you'll be sampling the Naboo: Theed map, playing as a Clone trooper or Separatist droid in a desperate battle for control of the royal palace. You'll earn Battle Points as you defeat foes and redeem them to summon vehicles, upgrade to reinforcements like the B2 Super Battle Droid, and become a hero like Rey... or a villain like Darth Maul. 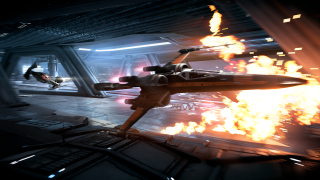 In Starfighter Assault, you'll join squadrons of teammates in a battle to defend an Imperial Star Destroyer in the space over Fondor... or destroy it You'll get your first chance to try out Star Wars Battlefront II's three new starfighter classes and pilot Hero Ships from the Prequel Trilogy, Original Trilogy, and the New Trilogy. 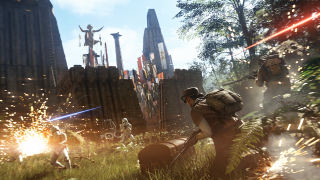 You'll also get your hands on Strike mode in the new Takodana map, where the Resistance and First Order battle around Maz Kanata's castle. Strike is a class-based mode – no heroes allowed. Instead, players rely the unique skills of the Assault, Heavy, Specialist, and Officer, utilizing teamwork to seize objectives. 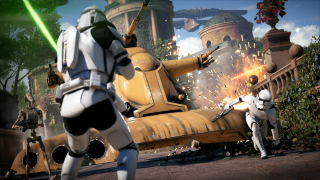 Finally, you'll get a chance to sample Arcade Mode on Naboo, where one or two players take on groups of AI opponents. You'll be able to try out two Arcade options: a team battle with AI allies and enemies, and a one-vs. many scenario pitting the player against a tide of foes. There's even couch co-op for players on PlayStation 4 and Xbox One. 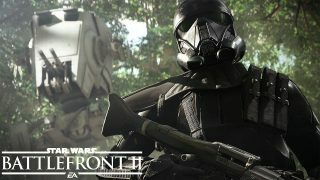 The Star Wars Battlefront II Beta is among the biggest ever distributed by EA, so be mindful that downloading and installing will take a bit - so plan accordingly! Keep a close watch on EA Star Wars Twitter, Facebook, and Instagram for more.